This Factory Five '33 Ford wears a very loud shade of Lamborghini green, but it's not just posing, it's green enough to turn anyone envious. Under the hood's a CNG-fueled LS7 exhaling at 650 HP though four catalytic converters. Any time you cross over the 500 HP mark you start talking serious performance, more so with a fiberglass hot rod immune to the obesity-inducing safety requirements set down by the Federales. This hot rod with the appropriate nickname "Gasser" set out to prove you can have an environmentally friendly hot rod that also goes like stink. Former United States Air Force aircraft mechanic Wayne Day built this beast and did so with clean driving in mind. 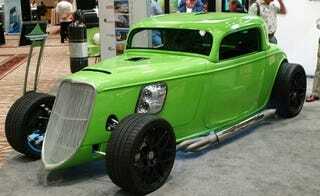 The car starts with a standard Factory Five 1933 Ford kit and includes such goodies as that GM LS7 V8 crate motor normally found in a Corvette Z06 fitted with MSD coil packs and tuned to run compressed natural gas. The engine isn't just burping out emissions though, as the exhaust stream is cleansed with four inline catalytic converters and despite the restriction total output is somewhere in the neighborhood of 650 HP. The TCI-tuned transmission is operated with a paddle shift system or via the Outlaw shifter and everything's routed through the tried and true Ford nine-inch rear end. Wheels are carbon fiber hoops with kevlar-reinforced tires and they apparently deliver massive traction as 0-100 MPH comes in a claimed four seconds (we're skeptical of that figure to be honest).